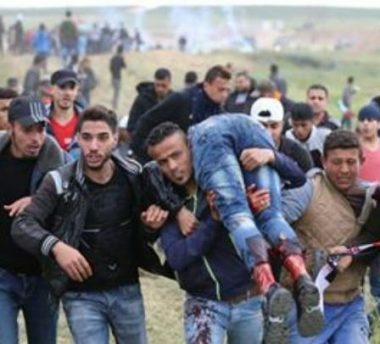 At least 12 Palestinians were injured on Monday by Israeli gunfire while taking part in the Great March of Return east of the Gaza Strip. The PIC reporter said that 12 Palestinians were wounded during attacks on al-Awda (return) camps east of Rafah, Khan Younis, Gaza and Jabalia. He added that the Israeli occupation forces stationed behind Gaza’s eastern border fence heavily fired teargas canisters at peaceful demonstrators causing a number of suffocation cases. The Palestinian people in Gaza launched on Friday a major demonstration called the Great March of Return along Gaza’s border with the 1948 occupied Palestine to demand their right of return, and it is expected to continue until the 15th May. 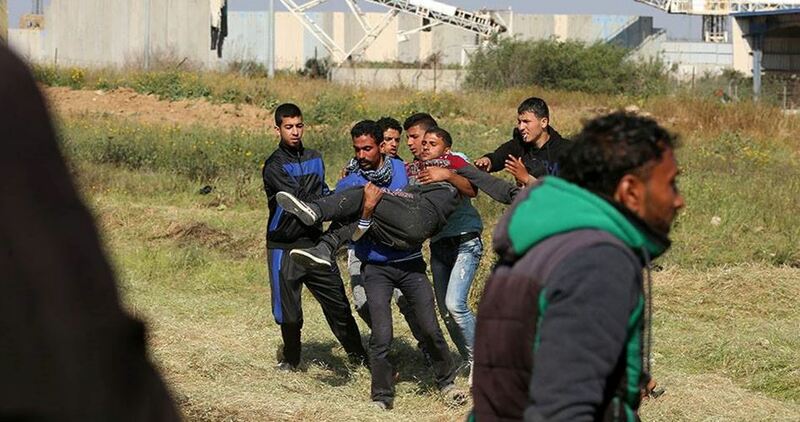 A Palestinian was shot dead by Israeli Occupation Forces (IOF) on the Gaza border Tuesday, the health ministry in the Strip said, as tensions remained high days after 18 people were killed during the Great March of Return. The ministry identified the martyr as 25-year-old Ahmad Arafa, saying he was shot in clashes east of Bureij in central Gaza. The Palestinian people in Gaza launched on Friday a major peaceful demonstration called the Great March of Return along Gaza’s border with the 1948 occupied Palestine to demand their right of return, and it is expected to continue until the 15th May. Palestinian Authority Prime Minister Rami Hamdallah has insisted that his government will not go to Gaza unless Hamas hands over control in one package, Safa news agency reported on Monday. Hamdallah’s remarks came a year after the PA imposed punitive measures on the Gaza Strip, which has been under a decade-long Israeli siege. The measures included slashing the salaries of PA employees in Gaza by 30 per cent, reducing electricity supplies to the enclave, cutting the number of medical referrals and forcing thousands of public servants into early retirement. Such a precondition, however, contradicts the agreement with Hamas which was brokered by Egypt last year. The deal stipulated a gradual handover of the Gaza Strip with the PA paying salaries for public servants in the territory. On the ground, Hamas has already handed over control of all the ministries, authorities and border crossings, but still collects internal taxes as handing over this function was conditional upon the PA paying salaries to its employees in Gaza, which has not happened yet. Israeli radio and TV anchor Kobi Meidan has been threatened with dismissal from Israeli army radio after he commented on Israeli crimes against peaceful Palestinian protesters in Gaza that took place on Friday. Immediately he was verbally assaulted by the Israeli public along with senior Israeli officials, including Israeli Defence Minister Avigdor Lieberman, who called for him to be sacked. According to the Times of Israel, Meidan clarified his comment to the commander of Army Radio: “[I] did not write a word against the IDF soldiers who are dear to us all, and that was not the intention, and if that was what was understood, I apologise for it”. Thanks to this statement, Meidan is to remain in his post. On Friday, which coincided with Palestine Land Day, the Israeli army shot dead 16 Palestinians and wounded 1,416 others. It was day one of a 45-day protest, the Great March of Return, which will reach its peak on 15 May, the anniversary of the Palestinian Nakba. The Palestine Liberation Organisation (PLO) has condemned the Israeli government for starting the construction of a railway that will cross occupied territory in the West Bank and East Jerusalem. The three-phase project will see the railway established on 2,000 dunams (500 acres) of land, including some belonging to the villages Al-Zawia, Masha, Badia, Saratah, Kafr-Deek and Bruqin. Palestinian agricultural land, trees and water sources will be destroyed in the process. “The Israeli occupation authorities plan to build 11 West Bank railways with a length of 475 km and 30 stations,” the PLO explained in a press release. Some of the stations will be in illegal settlements. The proposed railway is likely to help in the building of more settlements. According to data released by the Israeli monitoring group Peace Now, Israel’s construction of settlement homes rose by 17 per cent in 2017, the first year of US President Donald Trump’s term. This was more than the annual average since Prime Minister Benjamin Netanyahu took office in 2009. 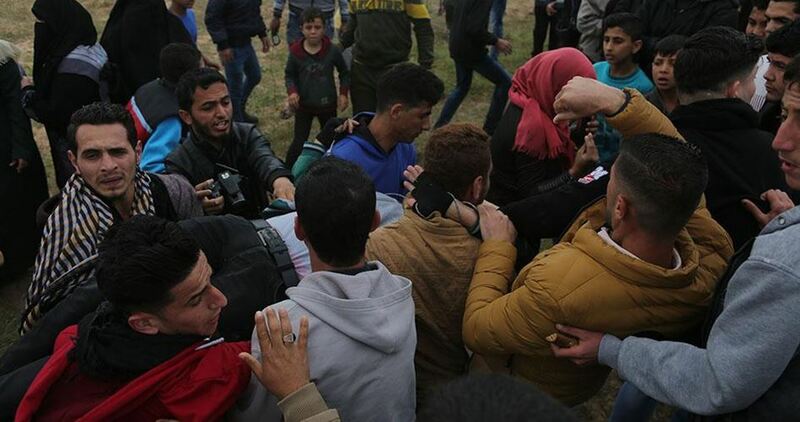 Israeli soldiers attacked, Monday, dozens of Palestinian protesters on their lands near border areas, in several parts of the Gaza Strip, and injured twelve Palestinians with live fire, in addition to causing dozens to suffer the effects of teargas inhalation. Medical sources said the soldiers shot two Palestinian, east of Jabalia, in the northern part of the Gaza Strip. They added that the army shot eight Palestinians, also with live fire, east of Gaza city. Another Palestinian was shot in Khuza’a village, east of Khan Younis, in the southern part of the Gaza Strip, and one east of al-Boreij, in central Gaza. 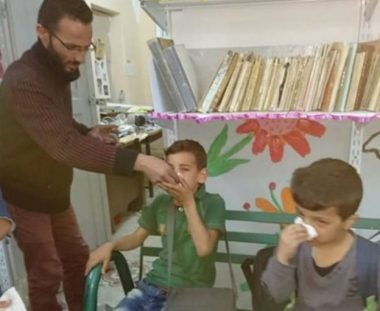 Dozens of Palestinians suffered the effects of teargas inhalation and received the needed treatment. Media sources in Gaza said many Palestinian protesters burnt dozens of tires across the border fence, and used mirrors to disrupt the soldiers’ vision, especially sharpshooters. Former Palestinian prisoner Tariq Ezzedine continues to be denied access to lifesaving medical treatment, reported colleagues and his family. Ezzedine was released to the Gaza Strip as part of the 2011 Wafa al-Ahrar prisoner exchange agreement; however, the Egyptian government continues to prevent him from traveling through the Rafah crossing to receive treatment. Jaafar Ezzedine, Tariq’s brother, spoke to Palestinian news agency Wattan TV; he noted that his brother has leukemia, a form of blood cancer. He has been hospitalized in Gaza for two months but requires treatment that is only available abroad. While his doctors have prepared his medical reports and arranged for him to receive treatment, he has been denied entry into Egypt on two occasions. His brother is also a former prisoner who participated in a long-term hunger strike in Israeli prisons while held without charge or trial. During an opening of the Rafah crossing last week, Ezzedine came to the crossing two times after his name was registered on the lists of people approved to travel. Despite this, he was denied on both occasions. He noted that Palestinian ministries confirmed that Ezzedine’s name was in fact on the list and when Tariq went to the crossing, he was held there for a full day, his passport was kept and taken before he was told that he would not be admitted and must return to Gaza. Jaafar Ezzedine said that it is apparent that Israeli pressure on the Egyptian government is being exerted in order to prevent Tariq from traveling. He noted that the family will hold a press conference in front of the Egyptian embassy in Ramallah on 3 April in order to escalate pressure on Egypt to allow free travel to Tariq Ezzedine. Khader Adnan, prominent Palestinian prisoner, also issued a statement from prison, urging action to save the life of Tariq Ezzedine after the deterioration of his health. He emphasized the moral responsibility of the Egyptian authorities to allow Ezzedine to pass and reject the malicious role of the Israeli occupation. He called on all of the Palestinian factions and the former prisoners in Turkey, Syria, Lebanon and Qatar to act before it is too late for Ezzedine. Imprisoned Palestinian parliamentarian, feminist and leftist leader Khalida Jarrar conducted an internal education class in international human rights and humanitarian law for her fellow female prisoners held in HaSharon prison. In a report issued by the Prisoners’ Affairs Commission, it was noted that Jarrar conducted the class for 32 hours in half-hour sessions. Over 30 women prisoners, including some of the minor girls held in HaSharon, participated in the classes. Jarrar’s class exemplifies the educational role that Palestinian prisoners have always defined for themselves inside Israeli occupation prisons, known over the years as “schools for revolution.” Palestinan prisoners regularly organize classes among themselves along with reading circles and study groups to develop their political, legal and analytical knowledge. These classes are entirely self-organized and conducted by Palestinian prisoners, without the involvement and contrary to the will of Israeli occupation jailers. Jarrar said in the report that the course aims to analyze and describe the situation of the prisoners through the lens of international human rights and humanitarian law, especially those aspects pertaining to the rights of families and people in detention. She particularly noted the difficult and austere living conditions and poor physical and mental health situation of women prisoners in Israeli occupation prisons, as well as ongoing harassment by jailers and Israeli “criminal” prisoners. She noted that the course was one example of ongoing work to establish a cumulative, collective educational program for women prisoners in Israeli occupation prisons. Jarrar is held under administrative detention, imprisonment without charge or trial; seized on 2 July 2017, she was ordered to six months in administrative detention. Her detention was extended again for another six months on 28 December 2017. She is one of three women and over 450 total administrative detainees, among around 60 women prisoners and 6,100 total Palestinian political prisoners in Israeli jails. Administrative detention orders are indefinitely renewable and based on secret evidence. Palestinians can be jailed for years at a time under administrative detention. Jarrar and her fellow administrative detainees are currently in the middle of a 48-day boycott of Israeli occupation courts, demanding an end to the policy and practice of administrative detention. She previously was imprisoned for 15 months on charges of “incitement” for her political activity in defense of Palestinian prisoners and in advocating for Palestinian freedom. In addition to her parliamentary role, she is a well-known advocate for Palestinian prisoners and Vice-Chair of the Board of Directors of Addameer Prisoner Support and Human Rights Association. 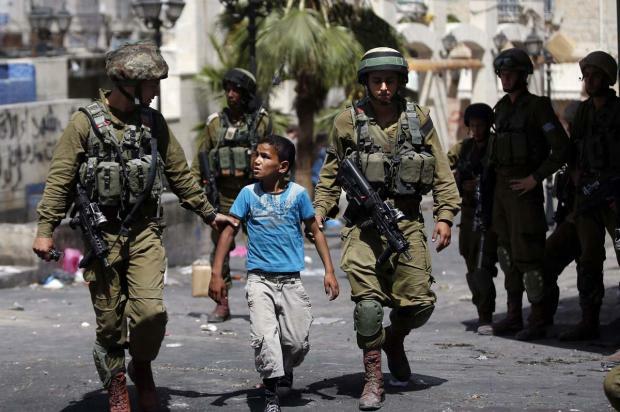 NABLUS, Occupied West Bank – The Israeli soldiers came as children were playing outside their village school south of Nablus. Within minutes tear gas had engulfed the playground, stones were thrown, and a 10-year-old boy was shot in the head with a rubber-coated steel bullet. The violence on that morning of Sunday, 25 March was but the latest in a series of confrontations outside Burin village’s high school and Ahmad Faris, the 10-year-old taken to hospital for stitches, was the latest casualty. “More than 10 students refused to go to school after Ahmad’s injury, and another one wet himself at school,” Ghassan Najjar, a local activist told Middle East Eye. The Palestinian education ministry’s annual report found 80,279 Palestinian children and 4,929 teachers and staff were “attacked” by Israeli settlers or soldiers. 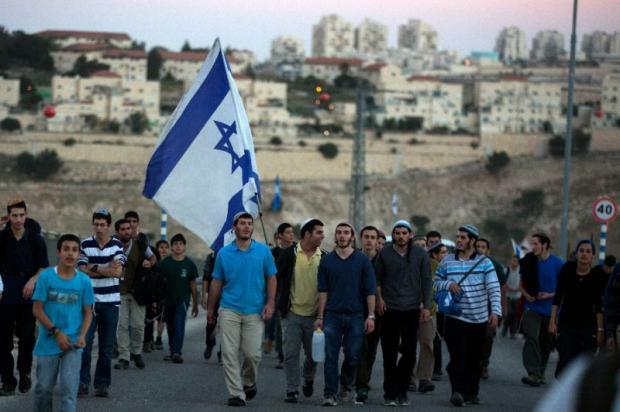 “Every week there are at least two or three attacks, from both settlers and soldiers,” he told Middle East Eye. Children often throw stones in retaliation. “Then the soldiers use this as an excuse to tear gas the school and shoot at the kids,” Najjar said. And 2018 is shaping up to be another dangerous year for children and teachers – Palestinian media has reported several attacks on schools since the beginning of the year. On 21 March, days before Faris’ injury, Israeli forces carried out a “show of force” in the Ramallah-area village of al-Mughayyir as children walked to school. 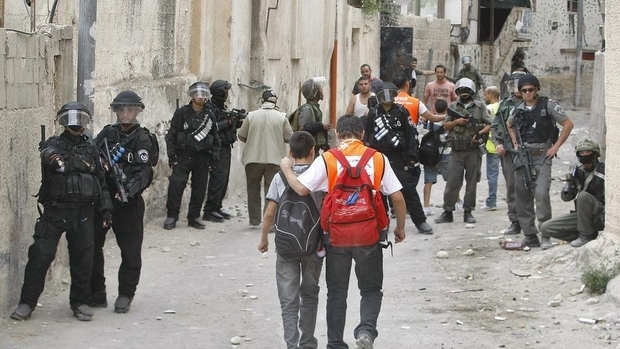 Eight children were injured by rubber bullets in the ensuing clashes. While such attacks threaten the safety of children and teachers, Najjar told MEE that his biggest concern was Israel’s ongoing confiscation of school land. In February, soldiers delivered a notice that Israel would be confiscating almost 15 acres of Burin school’s land for the construction of a separation wall. “This is the most dangerous threat facing the school now,” Najjar said. “The planned construction of this wall will put more pressure on students, and make it impossible for them to get a proper education. Under the pretext of being built without Israeli permits – which are nearly impossible for Palestinians to obtain in Area C – Israeli authorities demolished two EU-funded classrooms serving 26 Palestinian children in Abu Nuwar, sparking widespread criticism from Palestinian officials and the international community. “These classrooms have been demolished so many times now,” said Dawoud al-Jahalin, the head of Abu Nuwar’s village council. “Of course we hope to rebuild proper classrooms, but we need the help of the international community to put more pressure on the Israeli government to stop its demolitions,” he said, adding that the confiscations went further than ‘illegal’ buildings – Israeli forces last summer confiscated solar panels that powered the classroom and a local guesthouse. Located in the strategic so-called “E1 area” of the West Bank, Abu Nuwar is the largest of several local Bedouin communities threatened with demolition. 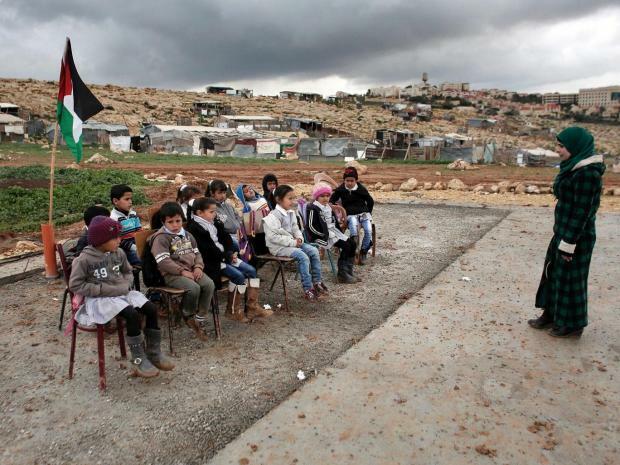 The plan would spell the end for Khan al-Ahmar, whose entire community, including its school, is already threatened with demolition and forced displacement, and Jabal al-Baba – where the village’s only kindergarten was destroyed in August 2017, one month before the start of the school year. 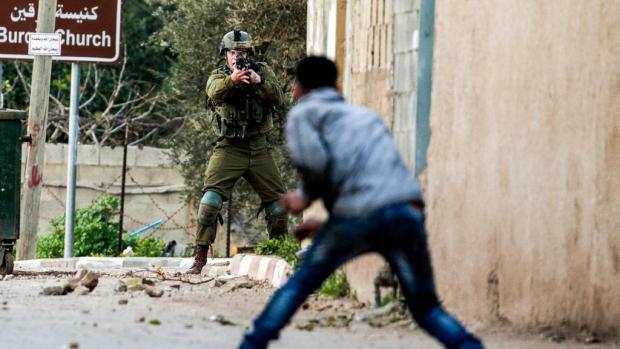 Rights groups have argued that Israel’s policies in E1 amount to forcible transfer – strictly prohibited under international humanitarian law and a violation of the Fourth Geneva Convention. “The Bedouin communities in the Jerusalem area have been here since the 1950s, after we were made refugees from our original lands in the Negev desert, and we are not even allowed electricity, water, or road networks,” Jahalin told MEE. “Meanwhile Maale Adumim, which was built illegally in the 1980s, has over 70 gardens and play areas, 12 schools, and buses to take their kids to and from school. The education ministry also highlighted the effect Israel’s extensive network of checkpoints and closed military zones on the right and safe access to education. The ministry’s 2017 report said Palestinian children and teachers at 51 schools were delayed at military checkpoints and gates while on their way to and from school. As a result, 26,808 students and 1,029 teachers were either prevented from getting to school or faced long delays, resulting in “35,895 classes wasted”. “There are only three schools in the entire area, and most of the communities do not have access to school buses, forcing kids to walk several kilometres to and from school,” Younis said. “As the kids walk to school, military helicopters fly overhead at low altitudes, whipping up clouds of dirt and sand around the children, hurting their eyes and delaying their journey to school,” he said. “In the summer, kids walking on dirt paths have to fend off snakes and scorpions, and by the time they arrive to school they have overheated and are thirsty – and they don’t even have access to running water. “Can anyone else in the world imagine themselves as a child, or imagine their children, trying to get a proper education under these conditions?